You can now use PayPal. Congratulations to Bob Tom (136 points) in STANDARD to win first place- and won $601. His 79% Pick Percentage ties the highest ever! For comparison, past percentage of winners: 2018- 67% 2017- 70%, 2016- 71%, 2015- 71%, 2014- 67%, 2013- 71%, 2012- 73%, 2011- 56%, 2010- 82%, 2009-76%, 73% in 2008, 78% in 2007, 70% in 2006, 71% in 2005 and 70% in 2004). James Mirante got second ($250) and Jeff Sims, third place ($150). In the SEEDED bracket, Phil Thwaits took first place with 280 points- he picked an outstanding 75% of winners - and received $164. He also is one of the rare, but not unprecedented, winners to NOT pick the Champion, Virginia. He made lots of points in early rounds, which is the key to the SEEDED bracket. And Bob Tom scooped second and collected another $69. Randy Miles placed third ($41)- Randy also did not pick Virginia but still placed. Recent history: 314 points- 2018, 251 points in 2017, 251 points in 2016, 300 in 2015, 341 in 2014, 257 in 2013, 261 in 2012, 276 in 2011, 266 in 2010, 239 in 2009, 270 in 2008, 212 in 2007, 255 points in 2006, 235 in 2005- 189. Finally, the SECOND CHANCE bracket. Maxwell Rose, 92 total points, claimed the winner-take-all total prize of $510. Maxwell managed to pick 5 of the Elite 8 teams, 3 of the Final 4 teams, and one of the Championship teams. I hope that everyone had fun this year. I’ll be back next year for the 28th time! As usual, please let me know if you have any ideas on how to make the NCAA Men’s Basketball Championship experience even more fun. Congratulations to Josh Gately (145 points) in STANDARD to win first place- and won $547. Because of upsets, Josh's winning percentage 67% is lowest in history! For comparison, past percentage of winners: 2017- 70%, 2016- 71%, 2015- 71%, 2014- 67%, 2013- 71%, 2012- 73%, 2011- 56%, 2010- 82%, 2009-76%, 73% in 2008, 78% in 2007, 70% in 2006, 71% in 2005 and 70% in 2004). Ron Yeager Sr and Joy Leventon. Ron got second ($228) and Joy Leventon, third place ($137). NOTE: Joy is my wonderful ex-boss from many years ago. What goes around, comes around! In the SEEDED bracket, Brandon Maddon took first place with 314 points- he picked 57% of winners - and received $188. And Michael Doyle scooped second ($78) only 5 points back, with 309 points. And then there is first-time player Angela Baker who pocketed $47 for her third place finish. Angela is the mother of the infamous 6-year-old Evie (3rd place last year)- guess they want to keep the money in the family!! Recent history: 251 points in 2017, 251 points in 2016, 300 in 2015, 341 in 2014, 257 in 2013, 261 in 2012, 276 in 2011, 266 in 2010, 239 in 2009, 270 in 2008, 212 in 2007, 255 points in 2006, 235 in 2005- 189. Finally, the SECOND CHANCE bracket. Reid Porter, 108 total points, claimed the winner-take-all total prize of $465.00. Reid managed to pick 5 of the Elite 8 teams, 3 of the Final 4 teams, and both of the Championship teams. And Reid has won the big-payout Second Chance Pool, 2 out of the past 3 years! New player Andrew Roper also had 108. But lost in the tie breaker! Final score was 79-62- or 141 Total points. Reid's tie breaker was 135 while Andrew picked 150. Reid won because his tie breaker did not go OVER the total score. I hope that everyone had fun this year. I’ll be back next year for the 27th time! As usual, please let me know if you have any ideas on how to make the NCAA Men’s Basketball Championship experience even more fun. Congratulations to Doug Malmoe (145 points) who picked 73% of the winners in STANDARD to win first place- and won $486. For comparison, past percentage of winners: 2016- 71%, 2015- 71%, 2014- 67%, 2013- 71%, 2012- 73%, 2011- 56%, 2010- 82%, 2009-76%, 73% in 2008, 78% in 2007, 70% in 2006, 71% in 2005 and 70% in 2004). Ladd Wiles and Evan Doyle. Wiles got second ($202.50) and edged out Evan Doyle, third place ($121.50), by one point. In the SEEDED bracket, as previously announced, Casey Yates took first place with 251 points- he picked 60% of winners. - and $247.00. And Ron Schmid scooped second ($61.25) only 2 points back, with 249 points. And then there is first-time player Evie Baker who pocketed $36.75 for her third place finish. It is unusual for a first time player to place in the top three. But warning to all all-longtime players: Evie has perfected a unique system for picking winners. Her father, Warren, sent me this email. Oh, did I mention that Evie is 5-years old! Evie Baker (5) filled out her bracket by looking at all of the mascots (head-to-head) and asking herself the basic question: "if both mascot were a 'stuffy', which one would I want?" This method resulted in a ridiculous 13 sweet sixteen teams correctly picked (only accomplished by one other person in both formats)! Recent history: 251 points in 2016, 300 in 2015, 341 in 2014, 257 in 2013, 261 in 2012, 276 in 2011, 266 in 2010, 239 in 2009, 270 in 2008, 212 in 2007, 255 points in 2006, 235 in 2005- 189. Finally, the SECOND CHANCE bracket. Evan Doyle, 112 total points, claimed the winner-take-all total prize of $415.00. Evan managed to pick 6 of the Elite 8 teams, 3 of the Final 4 teams, and both of the Championship teams. Outstanding. I hope that everyone had fun this year. I’ll be back next year for the 26th time! As usual, please let me know if you have any ideas on how to make the NCAA Men’s Basketball Championship experience even more fun. Congratulations to Patrick Yates (116 points) who picked 71% of the winners in STANDARD to win first place- and won $408. For comparison, past percentage of winners: 2015- 71%, 2014- 67%, 2013- 71%, 2012- 73%, 2011- 56%, 2010- 82%, 2009-76%, 73% in 2008, 78% in 2007, 70% in 2006, 71% in 2005 and 70% in 2004). Brandon Madden and Debbie Porter (who roared from nowhere to claim third- she was the only player out of 72 actually pick the Champion- I have never seen that before in this Pool) tied for 2nd-3rd with 114 points. Madden got second ($170) because his tie breaker was 149 while Debbie ($102) was 126- Brandon was closer without going over. In the SEEDED bracket, as previously announced, Mark Tom took first place with an exceptionally high 300 points- and $123.00. We know he must be a genius because he also won third place ($30.75) in this Pool with his second entry. And Patrick Yates scooped second (51.25) with a distant 239 points. Tom’s point total of 300 was a near record high- but I believe that his 78% winning percentage was a record high. Recent history: 300 in 2015, 341 in 2014, 257 in 2013, 261 in 2012, 276 in 2011, 266 in 2010, 239 in 2009, 270 in 2008, 212 in 2007, 255 points in 2006, 235 in 2005- 189. Finally, the SECOND CHANCE bracket Reid Porter, 100 total points, claimed the winner-take-all total prize of $355 by picking both Villanova to win- and by winning the tie breaker: 141 total points while Ron Schmidt, who tied him with 100 points, walks away with nothing since his tie breaker was only 123 points. Congratulations to Wendy Beasley (82 points) who picked 67% of the winners in STANDARD to win first place- and $357. For comparison, past percentage of winners: 2013- 71%, 2012- 73%, 2011- 56%, 2010- 82%, 2009-76%, 73% in 2008, 78% in 2007, 70% in 2006, 71% in 2005 and 70% in 2004). Mark Tom (78 points- $149) and Ron Yeager (77 points- $89) placed a close second and third respectively. In the SECOND CHANCE bracket, Kristi Nayquonabe takes the $310 prize by picking an 60% of winners. Not one person in this entire 62 person bracket picked UConn to win! Finally, the SEEDED bracket Ron Schmid carries $87 away as first place finisher without picking UConn to win- Ron's point total of 341 was a record high- 65% winning percentage. Recent history: 257 in 2013, 261 in 2012, 276 in 2011, 266 in 2010, 239 in 2009, 270 in 2008, 212 in 2007, 255 points in 2006, 235 in 2005- 189. Warren Baker placed second while third place finisher is Brent Kremen. Everyone should consider playing in this bracket next year- picking early round upsets is the key. It is fantastic that we had so many families playing this year. Although both the Doyles and the Porters were shut out this year, the Nayquonabe's did well. Conroy- 2, Doyle-3, Gately-3, Grady-2, Nayquonabe-3, Porter-5, Schmid- 3, Tom- 3, Wiles- 3 and Yates- 2. This was a very odd year- with many upsets. Never in NCAA history has a number 7 seed played for the championship! Never in our 19 year history has no one, in any of the three Pools selected the winner. Thanks to all for playing in a crazy year- our 19th year (started in 1996 when all entries were tabulated by hand!). Hope you all had fun. Email me if you have any suggestions for next year. Congratulations to Ron Yeager (142 points) who picked 71% of the winners in STANDARD to win first place- and $372. For comparison, past percentage of winners: 2012- 73%, 2011- 56%, 2010- 82%, 2009-76%, 73% in 2008, 78% in 2007, 70% in 2006, 71% in 2005 and 70% in 2004). Chris Nayquonabe (122 points- $155) and Kayten Porter (first time winner) (121 points- $93) placed a distant second and third respectively. In the SECOND CHANCE bracket, once again a Doyle (Peter) takes the $320 prize (in fact the Doyle clan took the took the top three spots- something in their blood??) by picking an 73% of winners. Finally, the SEEDED bracket newcomer Jennie Reed carries $116 away as first place finisher without picking Louisville to win with a respectful 67% winning percentage and 257 points. Recent history: 261 in 2012, 276 in 2011, 266 in 2010, 239 in 2009, 270 in 2008, 212 in 2007, 255 points in 2006, 235 in 2005- 189. Ron Schmid placed second again (2012) while third place finisher is Ladd Wyles. Everyone should consider playing in this bracket next year- picking early round upsets is the key. Thanks to all for playing in a crazy year- our 18th year (started in 1996 when all entries were tabulated by hand!). Hope you all had fun. Email me if you have any suggestions for next year. The 2014 NCAA Men's Basketball Tourney is approaching- draws for the 64-team tournament will be held next Sunday, March 16th. I will send out one more blast email to all once the draw has been completed, and the entry form is ready, on Sunday- and one on Wednesday as a final reminder. Since most of you are previous participants, you know how it works. If you are NEW this year, please review the links below for more detailed info. How Enter Selections: Click here and enter online. Click on either STANDARD or SEEDED just under spinning basketball. Please enter LAST name- then first name (example: Grady, Chris). If you enter more than once, please label the second entry #2 after your last name- example, Grady #2, Chris. If you have any issues with entry or payment, please email me. Please talk this UP! Forward web page link to friends so they can see last year's Tourney! 2012- Congratulations to Pete Dole (157 points) who picked 73% of the winners in STANDARD to win first place. For comparison, past percentage of winners: 2011- 56%, 2010- 82%, 2009-76%, 73% in 2008, 78% in 2007, 70% in 2006, 71% in 2005 and 70% in 2004). Patrick Yates (133) and Phil Tom (128) placed a distant second and third respectively. In the SECOND CHANCE bracket, Thomas Doyle takes the $290 winner-take-all prize by picking an excellent 87% of winners. Finally, the SEEDED bracket Matt Conroy carries $105 away as first place finisher without picking Kentucky to win with a respectful 63% winning percentage and 261 points. Recent history: 276 in 2011, 266 in 2010, 239 in 2009, 270 in 2008, 212 in 2007, 255 points in 2006, 235 in 2005- 189. Ron Schmid placed second while third place finisher is Patrick Yates. Interestingly, newcomer Julie Quesada picked a higher percentage (65%) of winners - just in th wrong order. Everyone should consider playing in this bracket next year- picking early round upsets is the key. 2011- Congratulations to Cole Calabro who was the only player out of 65 in STANDARD to pick UConn to win. Cole walks away smiling with $377, even though he picked only 56% of the winners. For comparison, past percentage of winners: 2010- 82%, 2009-76%, 73% in 2008, 78% in 2007, 70% in 2006, 71% in 2005 and 70% in 2004). Truly a tournament of upsets. Thomas Doyle ($157) and Brian Mohoric ($94) placed a distant second and third respectively. In the SECOND CHANCE bracket, Kevin Grady (nice job, son) again was the only player to pick UConn to win and takes the $325 winner-take-all prize. Finally, the SEEDED bracket Patrick Yates carries $99 away as first place finisher. No one picked the winner in this bracket- but Yates managed to pick 62% of winners. And his 276 points tops all previous years in recent history: 266 in 2010, 239 in 2009, 270 in 2008, 212 in 2007, 255 points in 2006, 235 in 2005- 189. Rick Jewett ($41) placed second while third place finisher Robert Stern pulled in $15- just enough to cover his entry fees! 4/07/2009-Congratulations to Pete Doyle for picking selecting 76% of the winners - the one point difference between first and second was the closest that I ever recall seeing in this Pool's 15 years. Warren Baker had the misfortune of losing by one point. But his consolation prize is that he also placed second in the Seed bracket. Randy Miles finished third picking 73% of winners. Last year the champ picked 73% of winners (78% in 2007, 70% in 2006, 71% in 2005 and 70% in 2004). The distribution of the pool is listed on the web site. Kevin Grady won the SEEDED bracket easily with a 239 points. Warren Baker placed second (213 points) and while Sam Wyles finished close with 204 points. Last year's winner had 270 points (212 in 2007, 255 points in 2006, 235 in 2005- 189 in 2004). Special kudos to Carter Kinnier, Pete Doyle and Kevin Grady. These gentlemen acted as "money-drop-of-points." NEXT YEAR: After 15 years, it is time for a change! After the first week the 64 teams are down to 16. As a consequence, over one-half of the Pool participants are effectively out-of-the-money. Next year we are going to try a way to keep the interest going for everyone. Entry fee will be raised to $15 (for STANDARD only). And a SECOND-CHANCE Pool will be added. When the Sweet 16 is determined, everyone will get to enter another pool, the SECOND CHANCE POOL. Entries will be handled the same way-over the Internet. This time, of course, the pool will have only 16 entries. This will be a separate pool and will in no way relate to the first pool. While the total pool dollars will be smaller, it still gives everyone hope! 04/07/08- Congratulations to Doyle Thomas for picking selecting 73% of the winners and all four Final4 participates as well as the eventual winner, Kansas. -- while Dianne Gately placed second with a pick rate of 71%. Chris Nayquonabe finished third with 70% of winners. Last year the champ picked 78% of winners (70% in 2006, 71% in 2005 and 70% in 2004). Sam Arabo won the SEEDED bracket easily with a record 270 points. Ladd Wyles placed second (258 points) and while P Y Yates finished close third with 253 points. Last year's winner had 212 points (255 points in 2006, 235 in 2005- 189 in 2004). Special kudos to Carter Kinnier and Kevin Grady. These gentlemen acted as "money-drop-of-points." Carter had 25 people in his group while Kevin found 26 participants in the Chicago area (the remaining 29 mailed checks directly to me). Next year we will have a contest between these 2 groups to see who can get more participants- $25 to winner (Carter or Kevin)! 04/02/07 Congratulations to Ladd Wyles for picking Florida to repeat while Joe Nayquonabe placed second - both had an outstanding pick rate of 81%. Pete Doyle finished in third with 78% of winners. Brandin Madden won the SEEDED bracket with 212 points. Kevin Grady (good job, son) placed second and there was a tie for third between Brent Kremen and Randy Miles. 04/04/06 Reid Porter, with a total of 100 points (70% correct picks), picks up the $216.50 first prize in the Standard Division (60% to winner, 25% to second, and 15% to third place). No one this year picked the winner, Florida although all three top contestants had 2 of the final 4 picked correctly. 4-year old genius Kate Doyle placed second with 90 points (63%)- although I will make the check out to her Dad, Pete. Phil Tom (1) tied with himself (Phil Tom (2)) with 86 points (65%)for third place. Yes, I did predict more winners than Kate (65% vs 63%)- but Kate picked more in the later rounds when more points were awarded. Phil Tom returns in the SEEDED Division to barely win with 255 points (65%)- Warren Baker debuts with a second place finish, 250 points (62%) while Robert Stern placed third with 201 points (59%). NEXT YEAR: Next year we are thinking about raising the entry fee by $1 to $11. The extra dollar would go to the person with the dubious honor of finishing last in each division. While it is conceivable that someone might try to "win" last place, the biggest loser would at least recover his/her entry fee. Imagine what would if someone had picked George Mason this year to win, in an attempt to place last-- they might have won. Let me know your thoughts on this idea. 03/19/05: 64 to 32! The Tourney is off to a great start. Only a couple of major upsets (hello, Syracuse; hello, Alabama, hello, LSU--and hello, Kansas). Bucknell wins its first NCAA Tourney game EVER! POINTS GAUGE: It's just a graphic to show how many points a player has already received and how many more possible points he can get. The number in yellow shows how many points the player has now- the number in green shows how many more points the player could accumulate in every entry picked is correct. PENCIL: Clicking on the pencil in Tournament Standing will show all the players that picked each team of that game. A cool new feature. I have been updating the Results and the Standing Reports several times daily, and I will continue to do so this weekend. The time and status of the tournament are post at the TOP LEFT on each report so you will know when it was last updated. 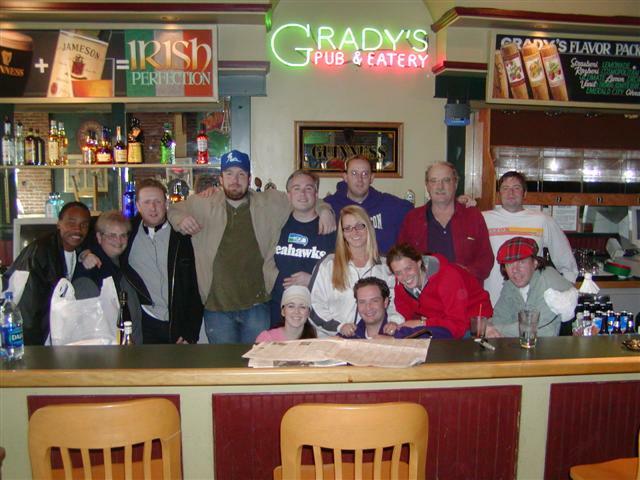 As most of you know, I sold GRADY's GRILLHOUSE last May (2004). I have had numerous requests to keep the Tourney going, so I am going to do so. I have moved the GRADY'S GRILLHOUSE web page to my personal server- please bookmark this location. Entry forms, rules, standings, will be posted here. I will need to receive these checks prior to Thursday's (March 17) cut-off deadline. So please mail checks NOW- and use the web-based entry forms to make your selections after the Sunday, March 13th bracket drawings. 05/04/04- GRADY'S served it's last Kelly's Big-K Prime Rib sandwich yesterday, Tuesday. I sold GRADY'S to the owner of the successful Madrona Eatery and Ale House. Burke Shethar, and his crew, are going to extensively renovate GRADY’S and shortly will reopen as the MONTLAKE ALEHOUSE. So, bear with Burke while he creates Montlake’s newest eatery. Remodel should take 4 to 6 weeks. 04/06/04- UC wins it all. In the STANDARD DIVISION, Pete Doyle is the first person ever to win, without having picked the tournament champion. But he did pick 70% of all the winners. Outstanding. Brain Hadfield and Robert Desmond tied for second with one point less than Doyle. This year we had 64 entries. My son, Kevin Grady, picked UConn to win the SEEDED DIVISION. He was the only player in the pool of 14 that picked the eventual winner. His 208 points beat last year's 203 points. Robert Stern finished second, followed by Brent Kremen. 03/18/04- Follow results here. Results will be updated by 8AM Friday, Saturday, Sunday, and Monday mornings for the first weekend. I will be traveling to Coos Bay Friday, Saturday, and Sunday to visit my granddaughter. I hope to be able to update this web page remotely-- if it fails, then results for these 3 days will be posted Monday morning. 03/17/03- Click here for the RULES. If any problems come up, what is printed in Rules shall prevail! 04/08/03- SYRACUSE CHAMPS!!! Diane Gately grabbed the Standard Division's first prize of $336! Good job! Jason Thomas took second with Pete Doyle picking up third place. The Seeded Division was over before the Final Four started- Bill Alberger took the $114 First prize, David Emrich placed second and Scott Tom beat Brent Kremen using the tie-breaker for third place. TIDBITS: No one picked Syracuse to win it all...Standard was won with 81 points (76%) compared to last year's 128 points (59%), and 2001 of 155 points - 203 points (63%) captured the Seeded first place (last year 245 points (also 63%) was needed)... 96 points were needed to place in the money for the Standard Division while 187 was needed in the Seeded...there were 56 entries in Standard and 19 in Seeded, up from 53 in Standard and 14 in Seeded in 2002. Bill Alberger wins the Farthest Away Award (although Bill Lakel is currently "on temporary assignment" in Hong Kong), as well as first in Seeded.. they must know something in Washington DC that we don't on the West Coast. Speaking of the coast, we had a couple participants from the Oregon coast, Coos Bay. My son, Kevin (he is going to kill me for saying this) is a Syracuse graduate-and did he pick his own alma mater to go further than the Sweet 16? Losers...Chuck Pietzsch, a first time participant, managed to get dead last in both brackets: 40% winners in Seeded - only 36% in Standard. All the players this year would love it if Chuck tries again next year. Thanks for everyone's participation this year. I will look forward to next year's Tourney. 03/13/03- Below I have copied final final thoughts from last year! Last year we had a total of 67 participants- let's triple that this year-- and triple the prizes!! Here are some highlights of last year's (2002) contest. In the Standard Division, Tim Keran's win with 128 points was less than Joe Bosch's 2001 win with 155 points. Tim picked 59% of the games correctly (several people were picked 65% of the games correctly-just the wrong games!!). Reid Porter managed to pick 43% of the games right to score 46 points and finish last in the Standard. Reid continued to demonstrate his ability in the SEEDED division-he got 93 points and 40% correct-and he maintained his skill level-dead last also in this division. In fact, both of his entries were second to last and last! Interestingly, his buddy, Phil Tom, duplicated this hat trick (minus one) last year-Phil was also last in both divisions in 2001 with 154 points and 54% correct in Seeded and 62 points and 27% in the Standard). Last year Rick Jewett won this division with 228 points and 63% correct while 2002 had Mark Anderson winning with 245 points and 63% correct. Player Brent Kremen had the highest winning percentage, a respectable 70%-but he picked the wrong champ! Total participants were 67 (53 Standard-14 Seeded) this year- way up from 32 (27 Standard-5 Seeded) .So that's it for 2002. I have awarded Mr. Porter a free burger at GRADY'S for being so nice to the rest of you. I hope so see you at GRADY'S during the Mariner season, as well as the NBA playoffs. 04/07/02- Our March madness ended with happy winners! Here are some highlights of this year's contest.